Name: Shizuko, a masked name under the real name of Karyuu. (火竜), meaning Fire Dragon. Likes: Spicy food, ladies, other dragons, nature, weapons, working out, and doing his job to be an excellent ninja there is to be. Dislikes: Betrayal, being in large bodies of water, dishonors, and being wounded. Special talents: Performing "Judo" arts, special forms of Karate, handling weapons and using them efficiently at a very high speed, combining moves with weapons, and some forms of Kung Fu. 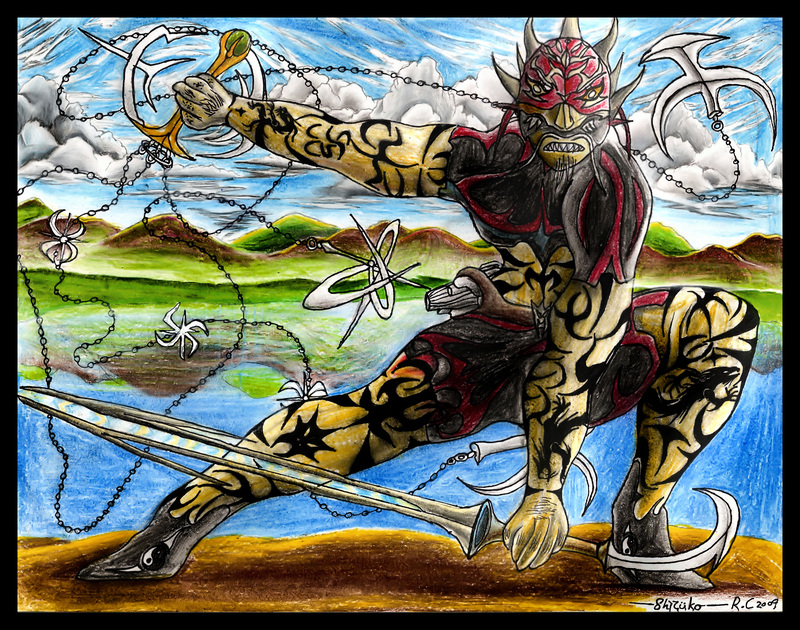 Ninpos: Has a capability to use all kinds of elements, but perferrably, and by his best skill, the fire elements. These include: Spinning Flame (紡紗火焰), Nova Strike (新斯科反恐精英), and Dragon's Inferno (龍的地獄), etc. Weapons: Electrical Surge Sword (displayed on picture), Ninja's four-blade fan, Fumas, and various Chained Blades. BACK STORY: Born in Yokosuka Japan, during the Twilight of the Fireflies under the Frozen Stars, his name was given for the gift of the Fire Dragon in the time of the Fire Element. Born in the year of the Ox, his Zodiac sign represents Leo, within the element of Fire. Given to this, his name was granted "Kiryuu", but to keep that identity from being contaminated at unknown possible sorts, his name was shelled with "Shizuko", as a safety from being too noticed in an outburst. In other words, this is to prevent any sense of over-popularity that can be good or bad, and if bad, could start an oriental war, in which is not an ideal to Shizuko whatsoever. At the age of 3, he experienced the year of the Dragon, in which gave birth to his former element that in which he practiced with, artificially. This also gave him his first dragon mask, in which was oversized at first, but could fit for an adult. So then, he was too young to wear it. Upon the family, he's an only child, but his parents were to take care of him until he turned 7, in which represents the number of the Dragon as the 7th animal of the 12 in the Chinese years. Aside from this, he trained to be a Ninja when he found out that his parents were forever disbanded from the Dynasty, as the notorious ninjas of shrouding shadows kidnapped and left them for the dead. By the time he was 12, he began to master his skills as a Ninja, and moved to China, in which he learned extra diversions of martial arts and was given the original golden sword of the dragon's breath. In this, he considered it a prized possession for the place he currently lives in: Beijing, China. By the time he was able to turn into a teenager, beyond the years of the animals, he set off his own adventures in order to slay and capture any notorious ninjas around the world, and anyone who commits truly vile crimes to dishonor the countries of China and Japan. As far as attending schools and studying many ways of various facts plus martial arts, he also managed to swipe major sea animals or specilal beasts that can be a threat to his living place. The people he have met during his young days were Dojo, in which he trained Shizuko from basic to advanced martial arts with kung fu. Then he met a former Ninja named Kong Rui, in which is a teenage person who studies very hard upon the various forms of martial arts, particularly on the Chinese ones like Kung Fu, and one Japanese named Judo, which Shizuko currently does best at. The two characters mentioned are now distant allies of Shizuko, and help eachother to overcome whatever fears and dangers approach to any of them, and to honor their lost and dead parents for the sake of saving China from its biggest downfalls, such as the economy. From now on, they strive to befriend the good ninjas, purify the bad ninjas, and find a way to learn and be proactive upon their family's mysterious past that meant for them to be Ninjas in the timed Destinies of the Dragons. That time, was a critical time, and then he grew up over the times to continue delving deeper to his dynasty up until the age of 24, in which he lives on.